Well, last week I didn’t post to the blog at all. This week I didn’t read a single blog from my Google Reader list of over 300. I feel as though I am a liar if I claim myself to be a book blogger and I don’t read, review, or even blog about life. While I could make up excuses that it has been a difficult and busy two weeks, the truth of the matter is that I just didn’t feel like it. Mom was indeed placed in hospice care and it has been an interesting time of orchestrating all the care givers and medicine schedules. I am delighted to say that her hospice nurse is a lovely woman who gives Mom all the time and care that she needs. She is friendly, knowledgeable, and easy to talk to. Mom has seemed to stabilize now and is doing fairly well….considering. We have had non-stop visitors for the past two weeks as well. My aunt from Houston came in for three days last week, my son came in Thursday for a long weekend, and my other aunt flew in and out yesterday. It is a good thing that my lesson plans were caught up and I did not have much grading to do during this time period. I have one more relatively “easy” week at school and then the week before spring break will be a mad dash to complete all assessments for the quarter. I had an epiphany this week. Well, probably not a true epiphany, but I actually experienced what I knew to be true. The first eye-opener is that not all classes are equal. I can teach the same material – the same year – the same way – to two different classes and receive completely different results. Case in point: the 9th graders are reading To Kill a Mockingbird. In years past I have conducted a mock trial after we finish reading chapter 21. There have been times when this activity has been a highlight of the year – and times when this activity has fallen flat. This year I have two English 1 classes: one is a class of eight students, 7 of which are boys. The other class is a class of twelve students, evenly split boys and girls. The class of eight has two “high level” learners, while the class of twelve has at least eight “high level” learners. The trial in the first class was mediocre at best. While all students managed to bring their scripts, only two were in “costume” and few had truly rehearsed the lines to the point of performance. At the end of the class period I felt as though I had wasted precious class time with this activity. The second class was the direct opposite. While everyone had a script, all but two had fully rehearsed the lines – almost to the point of memorization. The enactment was filled with proper intonation and emotional acting. Again, all but two had a costume, some quite elaborate complete with wigs and mustaches. Students knew entrances and exits and it was a pleasure to watch this classic scene enacted by such talented individuals. I anticipate class discussions on Monday to be different as well. I fully expect that the second class will want to delve deep into the injustice that occurred in this court of law. I expect them to dissect Atticus’s closing argument as a piece of literature worthy of study in a high school government class. I expect them to be emotionally charged when we discuss Jem’s reaction to the verdict. I am not so confident that the other class will have much to say. And I feel sorry for them. Yes, the study of lines and creating a costume was extra work – but the dividends were so much greater. For this second class, the mock trial will be a fond memory of their high school career. I just hope that the other class fondly remembers the lessons that Atticus teaches us — even today. It is nearly the end of the second month of the year and I think it is a good time to review all those New Year’s resolutions that I named on January first. While I have abandoned some and postponed others, I have managed to keep two going strong to the point that I think they have become good daily habits. If I had to sum up the extent of these resolutions, I think they were all developed to help me create a more balanced life in 2011. I wanted to relax more; I wanted to be in better shape; and I wanted to deepen my spiritual relationship. While I have a long way to go in finding that perfect balance, I have managed to develop a morning “sit up” routine to strengthen my core abdominal muscles and I have maintained daily devotions for eight full weeks. I discovered a daily Bible reading program that works well for me: a different section of the Bible each day so that I do not become bogged down in the ‘begats’ or ‘thou shalt nots’ that have always plagued me before. I have also discovered that blogging is the perfect way for me to personalize the scripture. In the past I would try to journal, but my hand would always ache and I would become discouraged before the end of the second week. Blogging is quick and easy – and it is a way for me to look back and review my spiritual walk if I so desire. While I doubt that any of you would be interested in reading these personal dribbles, I have set up a separate blog to record these thoughts. The exercise routine will be increased in mid-March (that is, if the weather cooperates during Spring break) to include what I hope is a manageable cardiovascular routine. I timed the route and it is exactly 1.1 miles to the nearest Starbucks. My plan is to walk to Starbucks, carrying my netbook computer in a backpack – spend a half hour or so sipping a beverage at Starbucks and writing (yes – that is another resolution that has fallen by the wayside) – and then walk home. This will hopefully provide 8-10 miles of walking per week (maybe more) and about 4-5 hours of writing. I will be becoming more physically fit – taking care of my heart (which apparently is genetically prone to health concerns) – and relaxing in an environment that is conducive to my academic pursuits. That is at least the game plan. Yes, I do continue to read for about twenty minutes before bed, but that does not allow me to finish many books. I have almost completed The Second Journey and have enjoyed this one as much as the other Joan Anderson books that I have read. In this book she speaks a lot about her ailing mother and how she balances those responsibilities with her own personal needs. It is exactly what this woman of the sandwich generation needed to hear. I have skimmed through several books on quilting – but have decided that with this particular craft, I just need to delve in and experience it for myself. 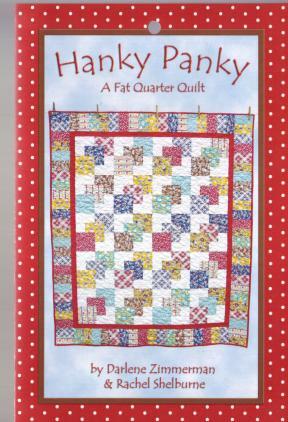 I plan to start a Hanky Panky quilt – but only in a 2×2 size — big enough for a Bitty Baby and not overwhelming for me. I still plan to read Jane Eyre over the next couple of weeks in anticipation of the release of the movie in March. I went to see The King’s Speech last night (for the second time) – and the previews for Jane Eyre look wonderful. I think I might be able to coerce a few students to see it with me as an extra curricular school activity. Well, that is what is happening in my neck of the woods. Not too much in the book blogging arena I am afraid, but I have not given up on returning to that passion in the not-too-near future. Please bear with me. I hope that all of you have a most pleasant week – and that March chooses to come in as a lamb rather than lion. I, for one, am quite tired of this wild, wacky, weather. A book in the Bible that I recently discovered and like very much is Sirach in the Old Testament. Reminds me of Aristotle's Ethics. I can quite understand your lack of interest in blogging right now. Take care. Unfortunately life does have a way of messing up our plans, and oftentimes prevents us from doing what we really want to be doing. Glad to hear things are settling down with your mom. Just go with the flow and do what feels right, no need to obsess about goals and resolutions. Have a good week. Sometimes I don't feel like blogging either. I'm okay with that these days because when I ask myself, do I want blogging to become a chore, the answer's a very clear No, and I've let that guide me! Love these glimpses of your life, like always. Your walking/writing plan for March sounds wonderful. Molly- I like you! I'm glad that you just said it like you felt—you just didn't want to blog. I feel like that more often than not and lately I've only posted a few times per week on my blog. There are so many components to our lives and blogging is such a small one in comparison to everything that you do on a daily basis. I've been attending a Women's Bible study on Wednesdays which leaves me with little time to get on the computer that day, but you know what? I'm good with that! I'm glad that your mother is doing well…that's all we can ask for isn't it? I would love to be a student in your class..your ideas excite me. Now I'm off to check out that Bible reading plan (I read through the Bible in a year back in 2005) and I want to check out your other blog. Take care and remember- NO GUILT! I am so sorry to hear about your mom, Molly, though Hospice is a good step, I would think – for you mom and for you as well. My thoughts and prayers are with you. I enjoyed hearing about your trials. It is interesting, isn't it, how group dynamics, interest and ability levels, gender ratios, and so forth play a role in such an activity. It makes you wonder about real trials, doesn't it? Have a good week. I'm off to check out your other blog. I am so discouraged to hear about how little one of your classes valued what they did with regard to the trial in To Kill … If any book should affect them profoundly, and if any class activity such as putting on the trial should, it should be this. Is there any hope for them? I took a peek at your new blog. When I have time, I'll read more. It's interesting that you're a "T", though this doesn't surprise me, and you've made a connection between that and struggles with faith. I have struggled with the Christian faith for decades, and I don't have being a "T" as an excuse. I'm more of a feeler, (INFJ) but even so, belief is difficult. I love your idea to walk to Starbucks and write – kills two birds with one stone (so to speak!). And I absolutely love that you are going to try your hand at quilting…email me if you have any questions…and definitely share your project with us!! You are certainly a book blogger! Blogging is a hobby and there are times in our lives when it just doesn't fit into our schedules. You have so much going on right now, I can understand why you haven't felt up to blogging. I'm glad that your mom was lucky enough to get such a good and caring nurse. It can make such a difference in these last days. And it is nice that everyone is coming in to see her and say their goodbyes. Although it is painful, it is such a blessing to be able to do this. I didn't realize your mother had gotten to this stage, and I'll make sure to say prayers for both her and you. It has to be so hard, but this is what we need to do, right? As far as blogging, I have noticed that the bloggers that were HUGE when I first started seem to have all taken big breaks, so I say don't worry about it. It is a hobby, we aren't getting paid for it, so do it when it feels right. I'm not taking you off my reader, and I doubt anyone else is either. Molly, I think you needed a break and it's good that you took it – at least from your blog. Taking care of your mom and having visitors to lookg after on top of your teacher's job is a LOT. I just hope you're not putting too much pressure on yourself with all of your resolutions – those can be changed as well. Listen to your heart and what you want to do, not what you must do. However, that walk to Starbucks and reading there before walking back sounds really good and like something that you will come to cherish. Oh Molly, books will always be there, and blogging. Your Mom – and you – that's what's important now. Take care of you, and when you are ready, we'll be here. Enough lecture, I just want you to find a little space of peace in your life, you are in such a trying and heartbreaking time right now. I do like the sound of you walking to Starbucks and back, and writing when there. I think it is a lovely plan and it's making me wonder what I can do with my walking and writing plans. I really hope your weather cooperates soon! Take care and have a good week, Molly. Molly, we all know how busy you are. No one expects you to be online blogging and reviewing all the time. We just love it when you do post occasionally, so we know you are OK and still WRITING! I am sorry to hear about your mum, but glad to see she has settled into hospice care and is being looked after by someone you trust. Very impressed by your walking plan, I may have to do something similar. Sorry to hear about your mother, but great that she is taken good care of in a good hospice. I have also been sort of away from blogging, though not for only two weeks, but for months. I haven't really read that much – but curiously enough, now that you mention that book – I am reading To Kill A Mockingbird. I haven't read it before, it is not on the Danish reading curriculum. But now I am, and I hope to finish it and a bunch of other books, soon. Like others said: books and blogging will be here when you are back and ready, so take care of yourself and your mother and other family. Good thoughts from Cold Copenhagen, Denmark. So happy to hear that things have worked out well with your mom and that you were able to find a good person to care for her. It will make you life so much easier. I love your plan for your daily walk! Sounds like winner and I bet it will become one of your favorite parts of the day. Thanks for posting the daily reading schedule you found for Bible. I don't know if I can bounce around like it dictates but at least I've found another option. I also want to read the Bible daily but have a very hard time doing so. I think it's wonderful that you are putting your energy into that and blogging about your thoughts. Hope you don't mind that I followed on it as I'm hoping you will help inspire me to Bible read daily. Also, I love that you can walk to Starbucks. I keep hoping someone opens a coffee shop in my neighborhood so I could do the same thing. Jealous. Any plans to return to Breadloaf for the summer? I enjoyed reading your tales about school. You are definitely NOT an imposter. I feel like one sometimes too. Life is just too busy sometimes and we just don't have time for everything. I enjoy reading about what you share about your journey as it has many common elements to my own.